Elections in India by using Electronic Voting Machines (EVMs) started more than 30 years after getting independence. Till then only paper ballots were used. Finding that there were many malpractices like Vote rigging, forged voting, booth capturing with muscle power, too much time consumed in getting the paper ballots packed and to avoid the wastage of tons of paper during election process, Election Commission of India thought of alternate and better way of using voting rights by citizens. Accordingly, to begin with Electetion Commission first used the EVMs in 1982 in the by-election to North Paravur Assembly Constituency in Kerala at some of the polling stations. Later the EVMS were used in select constituencies of Delhi, Madhya Pradesh and Rajasthan. The experiments were found successful and later in 1999, the EVMs were used in the Goa Assembly general election (entire state). In 2003, all by-elections and state elections were held using EVMs. After that, Election Commission decided to use only EVMs for Lok Sabha elections in 2004 and did away with paper ballot. Elections have always been a matter of controversy in India. Be it Electronic Voting Machines (EVMs) or paper ballots, both have had their fair share of doubts and shortcomings. During the reign of paper ballots, a party’s win in the elections was attributed to booth capturing, in today’s time, it is blamed on EVM tampering. The first accusation of EVM tampering came forward way back in the 2009 General Elections when BJP lost elections. The so-called EVM hacking or tampering was first put forward by LK Advani, the leader of BJP. Subsequently, when BJP won the General Election in 2014 by a majority of 51.9%, BJP quietened while Congress put forward the same issue of EVM hacking. Later, in Uttar Pradesh Assembly elections held in 2017, BSP, AAP fiercely argued about pre-programming in the EVMs so that the vote went on to a preferred party. This was supported by Congress and Samajwadi party also. Amidst these claims and the shifting of certain developed nations from EVM to paper ballots again, some Indian parties are also putting forward requests to shift back to paper ballot voting in lieu of possibility of EVM tampering. This statement from Election Commission and after the several open challenges in the past to demonstrate how the Indian design of EVM is hackable were proved futile has put the accusations at rest somehow. The best thing about paper ballot is that it cannot be hacked. No matter the complexity of the activity it is used for, it cannot be pre-processed to give a certain outcome. There is no algorithm or electronic wiring that can be tampered with by an individual or a group of experts for that matter to give a favourable result. In October 2006, the Netherlands banned the use of EVMs. In the year 2009, the Republic of Ireland banned its use which is followed by the Italy in the same year. In March 2009, the Supreme Court of Germany ruled that voting through EVM was unconstitutional. The Court believed that transparency in elections is the constitutional right of the people, but "efficiency" is not constitutionally protected value. Amidst these countries adopting paper ballots apart from developed nations like USA and England already using it, Indian political parties are putting forward the notion why it cannot be done in India. But, what’s good for their country might not necessarily be good for our country. With different systems of democracy in these countries it is only natural for us to have different election methods as well. Reverting back to paper from electronic means is the same as turning back to primitive raw meat even after the discovery of fire. When even the most polluting industries are trying to become greener and reduce their carbon footprints, using paper on such a huge scale despite more eco-friendly options being available is a direct neglect of the environment. The votes cast are counted manually and is a tiresome and error prone task. There were approximately 80 crore registered voters in India during the 2014 General Elections and this figure is expected to increase in the 2019 elections. Counting of 80 crore votes manually is quite difficult and it takes many more man days to count the votes and arrive at the result. This results in miscounting of votes and adds to the already huge time taken to count. In Panchayat Elections in Odisha, conducted using ballot papers, there was a scene of miscounting wherein candidates won according to the second counting. However, there is no way of knowing whether the first count was correct or the second. One can never be sure. Aside from booth capturing, other methods of vote manipulation have come into play in the past elections. This includes the difference in inks during vote casting. A video from the Rajya Sabha Elections in Haryana showed how the vote casting times were different for BJP MLAs and for Congress MLAs and that later the votes cast by Congress MLAs were not taken into consideration due to change in the pen used for casting votes. Sometimes, even some papers where votes are cast can be changed voluntarily or under forced circumstances thus, making the voting scenario quite unsafe for both voters and members of the election commission. With the shift from manual to technological resources, the election system has inadvertently become more efficient. Be it in terms of faster result announcement, elimination of miscounting of votes or the simplicity of the vote casting method, the system has become faster and more trustworthy than the paper ballots. Where in paper ballots instances of miscounting led to questions regarding the winning of candidates, EVM puts that dilemma to a rest. The VVPAT was introduced in EVMs by Supreme Court order in 2013. This is essentially a printout of the vote that a voter has cast. This system was developed to make sure that voters were satisfied that their votes were being cast to the candidates chosen by them and not to any other party or candidate. The VVPAT is a separate unit attached to the main EVM unit and provides a paper printout of the vote cast by the voter. Where the paper ballot system is fixed in time, with almost no scope of improvement in the future, the EVM technology can be further improved to remove the glitches seen in the various machines and perfect it to be a fool proof system in the future. The Election Commission of India has introduced a new model of the EVM known as the M3 Model to be used in the 2019 General elections and it has claimed that this new model will eliminate the instances of faulty machines that were seen in the past. The Election Commission threw an open hacking challenge in June 2017 for whoever claimed that the EVMs could be tampered with. This challenge came amidst various claims by cyber experts that they could be hacked and pre-programmed. Among the most prominent cases was the cyber expert Syed Shuja who claimed via a Skype Interview from London that he was among the developers of the machine and could hack EVM. However, his claims were proven invalid when he could not hack the machine. More often than not, EVM malfunctioning during the election process has been reported in the past as a result of some inherent defects in a particular machine. Although the machine is replaced on receipt of the malfunction report, voting process remains hampered for the time being and sometime a repoll has to be done. However, any machine in the world can malfunction despite all the checks. Besides, the second machine arrives within no time and the votes stored in both the EVMs are taken into account. EVM tampering is intentional and is not backed by any evidence so far of being possible. Tampering is when an individual or a group of individuals hack the machine so as to register all the votes on the particular EVM to a certain favoured party. Let’s consider the possibility that EVM can be hacked, if not right now, maybe in the future as we have seen with all electronic gadgets and machines, be it smartphone, TV, computer; anything can be hacked. The EVM used in India consists of a control unit, a ballot unit and a VVPAT. Each EVM unit is separate and is not connected to any other device. So, even if tampering was possible, each EVM would have to be tampered with separately which would require extensive preparation on part of the hacker and a whole network of cyber experts along with help from the Election Commission itself. This is quite a far-fetched theory to be possible. 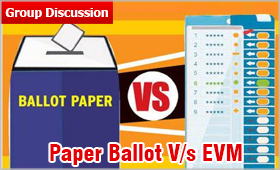 EVM or Paper Ballot - Which is Better? Even though quite a few controversies surround EVMs, it all revolves around whether the EVMs can be hacked or tampered with, which has not been proven so far. These controversies by far are nothing compared to the unfair practices that were witnessed when the paper ballots were being used to cast votes during elections. Unless there is proof of tampering with EVMs, they are definitely the better option, but if they are in fact hackable, it might lead to catastrophe during elections which will be pre-determined. Thus, research and development should not be stopped to make the EVMs tamper proof and make the elections safe and fair for everybody. But reverting to paper ballots is definitely a retrograde step that must be avoided on accounts of the more unfair practices itself.